An epic battle for survival begins between man and vampire in The Strain—the first book in a heart-stopping trilogy from one of Hollywood’s most inventive storytellers and a critically acclaimed thriller writer. Guillermo del Toro, the genius director of the Academy Award-winning Pan’s Labyrinth and Hellboy, and Hammett Award-winning author Chuck Hogan have joined forces to boldly reinvent the vampire novel. 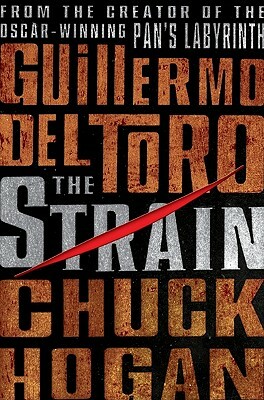 Brilliant, blood-chilling, and unputdownable, The Strain is a nightmare of the first order. Chuck Hogan is the author of several acclaimed novels, including Devils in Exile and Prince of Thieves, which won the 2005 Hammett Award , was called one of the ten best novels of the year by Stephen King, and was the basis of the motion picture The Town. Chuck Hogan es autor de varias aclamadas novelas, entre las cuales se encuentra Prince of Thieves que ganó el Hammett Award 2005 y que fue considerada una de las diez mejores novelas del año por Stephen King.